Nicholas Sparks is back in cinemas to appease a certain demographic and senselessly bore anyone who isn’t a part of it. 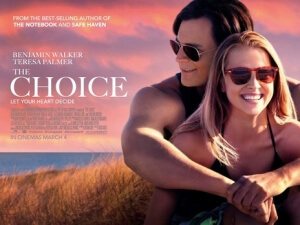 There honestly isn’t a whole lot to say about The Choice, based on the novelist’s 2007 book of the same name, other than it’s exactly what you expect by now from someone like Sparks, and even then it’s pretty unambitious stuff next to some of his other, more out-there stories. As ever, there’s a pair of lovers involved – in this instance, it’s hunkular vet Travis (Benjamin “for the last time, I’m not Liam Neeson” Walker) and his pretty next-door neighbour Gabby (Teresa Palmer) – and, like always, there’s several obstacles for them to get through if they’re to have their inevitable happily ever after, whether they’re third-wheel boyfriends (Tom Welling, looking beefier than usual) or, in the film’s devastatingly sentimental third act, deciding whether or not to pull the plug on someone when they’re comatose from a car accident. So, yeah; it’s pretty much every single Nicholas Sparks story you’ve ever read or seen by this point, so much so that it comes so close to self-parody even by Sparks’ standards (though not quite as much as The Best of Me ended up being). Walker and Palmer do start off having a fairly strong chemistry, but as time goes by you start to notice that their cute back-and-forths are beginning to come across as a little forced, and they start to resemble that one couple you know who have been together for a while but always act like they’ve only been going out for a couple of weeks. You sometimes get the impression that director Ross Katz was going for something like the screwball pairings of, say, Katherine Hepburn and Cary Grant in Bringing Up Baby or even Clarke Gable and Claudette Colbert in It Happened One Night, but both characters here are neither written as strongly nor even acted as strongly to leave such an impact, and the eventual forced path that their romance eventually heads down makes things even more unconvincing and unbelievable (for instance, there’s a section where we’re supposed to buy that the youthful-looking Palmer, real age 30, is a mother of two with the eldest being at least seven years old; sorry, but there’s just some things we cannot suspend our disbelief for). A film like this, with a plot this thin and continuously ludicrous, should not be more than 90 minutes long, yet The Choice clocks in at just under the 2-hour mark, meaning that it’s way more of a slog to sit through than first thought. It seems to be under the false impression that it’s meant to be something of a mini-epic, like how The Notebook was; spanning over several years (most of them in montage), having a bigger-than-it-should-be cast that includes people like Tom Wilkinson, Maggie Grace and Alexandra Daddario having all but nothing to do, and setting itself up for themes that it thinks are operatic and powerful, but are instead just as tepid and unambitious as your average Lifetime Movie of the Week. It takes forever for the main romance to even get into gear, and even longer for the main obstacle to even become a thing; you’re basically stuck there counting down the minutes until they actually happen. It’s incredibly dull to watch, unless you’re already a lover of this type of film and the majority of Sparks’ work, in which case go ahead and like whatever you like without fear of judgement; but for the rest of us, the choice we make over whether or not to watch The Choice couldn’t be easier. The Choice will likely appeal to anybody that is already a follower of Nicholas Sparks’ particular style (it certainly seems to have a lot of his usual tropes); anybody else need not apply.